Melamine sponge is the world's unique new type of environmental-friendly sponge which is of excellent properties of cleaning. -What is the difference between Melamine Sponge and traditional sponge in the market? 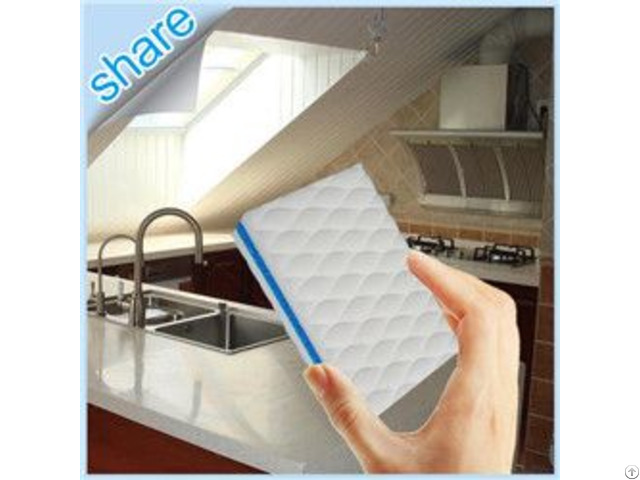 Melamine sponge is an open cell foam and its characteristics featured a three-dimensional network structure that provides physical absorption capacity to remove off the stains easier especially when it is wet by the clear water. It is not abrasive for object surface as the cell is smaller than one over ten thousand of a human hair. It saves much time, detergent, labor and money than using the traditional sponge. -What is our advantage of Melamine Sponge than others’? Basically the melamine foam from most of other Chinese suppliers are in density of 8.0-8.5 kgs/m3, that lower density means short-life, easy breakdown, easy scaling-off and almost one-off. Moisturize water, effortless to remove greasy stains and stubborn dirt. New type nano material Melamine Sponge, extremely powerful to clean off stubborn stains. New type material, innovative additive, newly nano technology. More practical, convenient and popular than traditional sponges. Exclusive technology in China, only SHARE can do it in China. High Profits to Agents/Distributors/Whole salers/Resalers.